This article is about the Eastern Orthodox patriarchate. For other uses, see Patriarchate of Jerusalem. The Greek Orthodox Church of Jerusalem (Arabic: كنيسة الروم الأرثوذكس في القدس‎ Kanisatt Ar-rum al-Urtudoks fi al-Quds, literally Rûmi Orthodox Church of Jerusalem),(Hebrew: הפטריארכיה היוונית-אורתודוקסית של ירושלים‎) and officially called simply the Patriarchate of Jerusalem (Greek: Πατριαρχεῖον Ἱεροσολύμων, Patriarcheîon Hierosolýmōn), is an autocephalous Church within the wider communion of the Eastern Orthodox Christianity. It is headed by the Greek Orthodox Patriarch of Jerusalem, the incumbent being Theophilos III since 2005. Christians believe that it was in Jerusalem that the Church was established on the day of Pentecost with the descent of the Holy Spirit on the disciples of Jesus Christ (Acts 2:1-41) and that the Gospel of Christ spread from Jerusalem. The Church celebrates its liturgy in the Byzantine Rite, whose original language is Koine Greek, the original language of the New Testament, and follows its own calendar of feasts, preserving the Julian calendar (that is thirteen days behind the Western (Gregorian) calendar). It is also often called "Σιωνίτις Εκκλησία" (Greek: Sionitis Ecclesia, i.e. the "Church of Zion"). Patriarch of the Holy City of Jerusalem and all Palestine, Israel, Syria, beyond the Jordan River, Cana of Galilee and Holy Zion, Theophilos III. The number of Orthodox Christians in the Holy Land is estimated at about 500,000. A majority of Church members are Palestinians and Jordanians, and there are also many Russians, Romanians, and Georgians. The Church's hierarchy is dominated by Greek clergy, which in effect excludes the Arab majority from the Church's upper ranks. This has been a point of endless contention between Greeks in the patriarchate, who are backed in this regard by the Greek government, Israel and the Turkey-based Ecumenical Patriarch of Constantinople, and the native Palestinian clergy- some of whom seek to nationalize their Church's leadership. 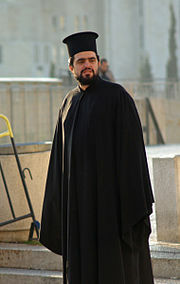 (see Arab Orthodox). The headquarters of the Orthodox Church in Jerusalem is the Church of the Holy Sepulchre. During the first Christian centuries the church at this place was the centre of Christianity in Jerusalem, "Holy and glorious Sion, mother of all churches." Certainly no spot in Christendom can be more venerable than the place of the Last Supper, which became the first Christian church. In the Apostolic Age, Christianity consisted of an indefinite number of local Churches that in the initial years looked to Jerusalem as its main centre and point of reference. (See also Jerusalem in Christianity and Early centers of Christianity) Some found their way to Antioch, where they undertook evangelical efforts, and to whom the term "Christians" was first used. Before the outbreak of the First Jewish–Roman War (66-73 AD) and the destruction of Herod's Temple in 70 by Titus, Christians led by Simeon fled to Pella in Decapolis (Jordan), where they remained until 135. The Jews of Judea again revolted against Rome in the Bar Kokhba revolt (132–136). By or during that time, the Christians had returned to Jerusalem. However, to punish the Jews for their revolt and to prevent further unrest, Jerusalem was made a Roman colony and renamed Aelia Capitolina by Hadrian. In 135, the Metropolitan of Caesarea appointed Marcus as the first bishop of the renamed Church of Aelia Capitolina. 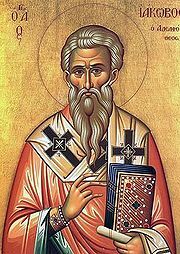 He was the first gentile bishop of the Church of Jerusalem (or Aelia Capitolina), all the previous ones having been Jewish. The persecution of Jews by Roman authorities in Judea increased, with most of the Jewish and Christian population of Judea being enslaved and dispersed throughout the Roman Empire. The importance and place of Jerusalem in the life of the Christian Church diminished, though a Jewish and Christian remnant always remained in the city and the land. Despite the strife, persecutions and meager population, bishops continued to be elected or named. Eusebius of Caesarea provides the names of an unbroken succession of thirty-six Bishops of Jerusalem up to the year 324. The first sixteen of these bishops were Jewish—from James the Just to Judas († 135)—and the remainder were Gentiles. The Metropolitans of Caesarea continued to appoint the bishops of Aelia Capitolina until 325. At the First Council of Nicaea in 325, though the bishop of Aelia Capitolina was still subordinate to the Metropolitan of Caesarea, the Council accorded the bishop a certain undefined precedence in its seventh canon. In a decree issued from the seventh session of the Fourth Ecumenical Council (the Council of Chalcedon) in 451 the Bishop of Jerusalem was elevated to the rank of Patriarch, ranked fifth after the Sees of Rome, Constantinople, Alexandria, and Antioch (see Pentarchy). Since then, the Church of Jerusalem has remained an autocephalous Church. Jerusalem was established as a patriarchate because of the holiness of the place; the special significance acquired between the First and Fourth Ecumenical Councils; the erection of magnificent churches; the conversion of a large proportion of the population of Roman and Byzantine Syria-Palestina to Christianity; the coming together of pilgrims from around the world; the importance of outstanding bishops, monks, and teachers of the Church of Jerusalem; the struggles of the Brotherhood of the Holy Sepulchre on behalf of Orthodoxy; and the support of various Emperors of Byzantium. The Persians occupied Jerusalem in 614 and took Patriarch Zachariah prisoner, along with the palladium of Christianity, the Precious Cross. Chrysostomos Papadopoulos writes in his history of the Patriarchate: "The Churches and the monasteries, inside and outside Jerusalem, were destroyed; the Christians were brutally slaughtered … thousands of prisoners purchased by Jews were slaughtered. Anything good that existed was destroyed or was plundered by the invaders. The monks were slaughtered mercilessly, especially those of St Savvas Monastery." In 637, after a long siege of Jerusalem, Patriarch Sophronius surrendered Jerusalem to Caliph Umar, but secured the Covenant of Umar I, which recognised Christian rights to protection. In 638, the Armenian Apostolic Church began appointing its own bishop in Jerusalem. After 638, however, Christians suffered many persecutions. Christian shrines were repeatedly ransacked and defaced by the successors of Umur, and there was great persecution all around. The most deadly persecution occurred during the time of the Fatamid Al-Hakim bi-Amr Allah (1007–1009), a schizophrenic, named the "Nero of Egypt" for his merciless acts. He persecuted ferociously both Christians and Jews. He ordered that in public Jews were to wear masks representing the head of an ox and bells around their necks; Christians were to wear mourning apparel and crosses one yard in length. Also, Al-Hakim ordered the destruction of the Church of the Holy Sepulchre. In the eleventh century, the Caliph Ali az-Zahir, under a treaty with Byzantium, permitted the reconstruction of the shrines. In the Great Schism of 1054, the Patriarch of Jerusalem joined those of Antioch, Constantinople and Alexandria as the Eastern Orthodox Church. All Christians in the Holy Land came under the jurisdiction of the Orthodox Patriarch of Jerusalem. In 1099, the Crusaders captured Jerusalem, setting up the Kingdom of Jerusalem and establishing a Latin hierarchy under a Latin Patriarch, and expelling the Orthodox Patriarch. The Latin Patriarch resided in Jerusalem from 1099 to 1187, while Greek Patriarchs continued to be appointed, but resided in Constantinople. In 1187, the Crusaders were forced to flee Jerusalem, and the Orthodox Patriarch returned to Jerusalem. The Catholic Church continued to appoint Latin Patricarchs, though the office holder resided in Rome until 1847, when they were permitted to return to the Middle East by the Ottoman authorities. The Orthodox Patriarch is the uninterrupted line of Apostolic succession to the see of Jerusalem. The Brotherhood of the Holy Sepulchre, which is closely linked to the Orthodox Church of Jerusalem, remains the custodian of many of the Christian Holy places in the Holy Land, sometimes jointly with the Roman Catholic Church and the Oriental Churches (Egyptian, Ethiopian and Armenian Orthodox Christians). Priest of the Brotherhood of the Holy Sepulchre in Jerusalem. Theophilos III became patriarch of the Church at a very difficult time in its history. The politics of the Middle East and the delicacy of the relations with the Palestinian Authority, Israel and Jordan continues to make the role and place of the Patriarch and the Patriarchate very challenging. In 2005, a crisis occurred in the Church when Patriarch Irenaios was stripped of his authority as patriarch by the Holy Synod of Jerusalem after he had allegedly sold church property in a very sensitive area of East Jerusalem to Israeli investors. The locum tenens (steward) until the election of a new patriarch was Metropolitan Cornelius of Petra. On August 22, 2005, the Holy Synod of the Church of Jerusalem unanimously elected Theophilos, the former Archbishop of Tabor, as the 141st Patriarch of Jerusalem. For some time the Israeli Government withheld recognition of Theophilos as the new Patriarch, and continued to only recognize Irenaios as Patriarch. This position has been criticised as defying the unanimous decision by representatives of all Orthodox Churches meeting at the Phanar at the call of the Ecumenical Patriarch withdrawing communion from Irineos and recognizing Theophilos's canonical election. Israel's refusal to recognise the Patriarch's temporal role, had inhibited the Patriarch's ability to take the Government to court and froze Patriarchal bank accounts. This in turn threatened the maintenance of the Holy Places and the Patriarchate school system with 40,000 students. It has been alleged that the origins of the dispute are part of a forty-year attempt by Israeli settler organizations and politicians to open up the Patriarchate's extensive land holdings worth estimated hundreds of millions of dollars. The Israeli newspaper Ha'aretz reported on February 4, 2007 that two Ministers in the Israeli Government offered to recognize Theophilos if he would give up control of several valuable properties. The Israeli press reports that senior officials of the Israeli government may have been involved in a fraudulent real estate transaction with the deposed Patriarch Irenaios and are afraid of the consequences of court action. In 2006, Israel refused to renew visas of many of the Greek clergy, which threatened to create to a serious crisis within the Church, as most of the monks are Greek citizens. Patriarch Theophilos applied to the Israeli Supreme Court in an effort to gain civil recognition. The Court was due to give a decision in mid-2006, but delayed giving a decision twice since then. A decision was due in January 2007, but the Israeli government again requested a further delay in the case. In May 2007, the Government of Jordan revoked its previous recognition of Theophilos III, but on 12 June 2007 the Jordanian cabinet reversed its decision and announced that it is once again officially recognising Theophilos as patriarch. Archbishop Theodosios (Hanna) of Sebastia has also called for a boycott of Theophilos. In December 2007, the Israeli government finally granted Theophilos full recognition. Irenaios appealed this decision to the Israeli Supreme Court, but that court ruled in favor of Theophilos. Not to be confused with Order of the Holy Sepulchre. The Order of Orthodox Knights of the Holy Sepulchre is a self-styled order under the protection of the Patriarchate of Jerusalem. The Orthodox Church has extensive property holdings in Jerusalem and throughout Israel and the Palestinian territories. In addition to numerous churches, seminaries and other properties used for religious purposes, church property holdings include the land on which the Knesset and the prime minister's residence are located, as well as an array of historic buildings in Jerusalem's Old City, including the Imperial and Petra hotels inside the Jaffa Gate of the Old City. Head of the Patriarchate and of the Holy Synod is Patriarch Theophilos III (Ilias Giannopoulos), Patriarch of the Holy City of Jerusalem and all Palestine, Israel, Syria, beyond the Jordan River, Cana of Galilee and Holy Zion. ^ "CATHOLIC ENCYCLOPEDIA: Jerusalem (A.D. 71–1099)". Newadvent.org. 1910-10-01. Retrieved 2011-07-10. ^ a b Eusebius, The History of the Church (Tr. A. G. Williamson, Penguin Books, 1965. ISBN 0-14-044535-8), see summary in Appendix A. ^ "Jerusalem affairs: Religiously political". Jerusalem Post. December 20, 2007. Dowling, Theodore Edward (1913). The Orthodox Greek Patriarchate of Jerusalem. London: Society for promoting Christian knowledge. Barry, David Sheldon (1976). The Patriarchate of Jerusalem in the fifth and sixth centuries. Madison: University of Wisconsin. Speros Vryonis, "The history of the Greek patriarchate of Jerusalem as reflected in Codex Patriarchicus No. 428: 1517-1805", in: Byzantine and modern Greek studies, vol. 7 (1981), London: Basil Blackwell, pp. 29-53. Runciman, Steven (1985). The Great Church in captivity: A study of the Patriarchate of Constantinople from the eve of the Turkish conquest to the Greek War of Independence. Cambridge University Press. Peri, Oded (2001). Christianity Under Islam in Jerusalem: The Question of the Holy Sites in Early Ottoman Times. BRILL. Wikimedia Commons has media related to Greek Orthodox Patriarchate of Jerusalem.